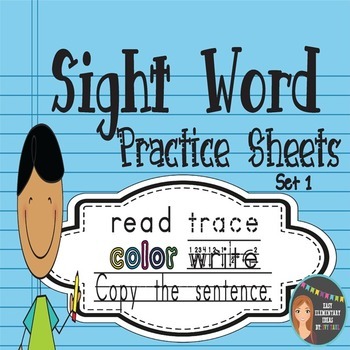 This packet contains 50 pages of sight word practice sheets PLUS fun bookmarks, flashcards, and a recording sheet for you to record student progress. The packet covers the first 50 words from the Fry First Hundred sight word list. You can see every word included by downloading the preview. 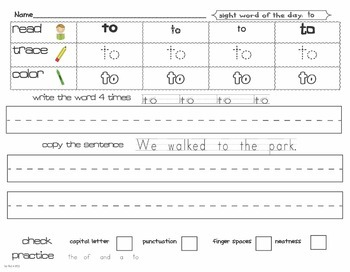 Practice sheets can be used for morning work, seat work, homework, or for RTI intervention. 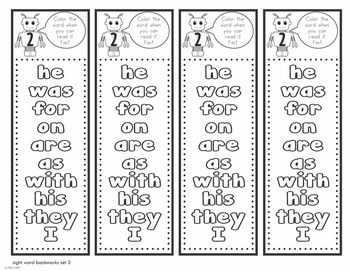 Students will read, trace, and color the sight word three times, write the word four times, copy the sentence using the sight word, check the sentence, and practice reading previous words at the bottom of the page. 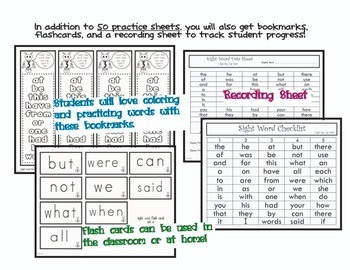 Bookmarks and flash cards can be used at school or sent home to show parents which words to study. Students will love coloring the words on the bookmark! Follow my store receive notifications on new products and monthly specials.